In areas like New Jersey where you want to be able to experience all four seasons without leaving your home, sunrooms and four season rooms are an excellent compromise. You get the beauty of the outdoors while still being inside. Because of the very nature of these rooms, you have to put some special thought into the flooring that you install for them. Examine some ideas for finding the perfect flooring for your New Jersey four seasons room. 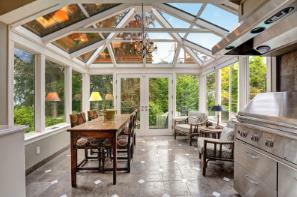 Tile can be a great choice for your sunroom or four seasons room. It’s durable, meaning that wear and tear from your family won’t show easily. 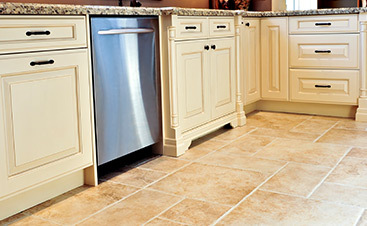 Tile also does well in an area where there’s humidity and dampness. Tiles can be slippery when wet, so keep that in mind in your decision-making process. Tile offers an easy clean-up compared to other options. In sunrooms, tiling can actually help keep the room cooler during the hotter months of the year when going with a lighter color. However, keep in mind that if you decide to go with a tiled floor that is rather dark in color, darker tiles may become hot to the touch after being in the sun all day. In the winter months, tile can be cold on the feet and may require you to add some rugs for warmth. When most people think of indoor/outdoor carpet, they probably think of that ugly green carpet that was meant to look like grass but missed the mark. The truth is that carpeting for inside and outside has come a long way since that green carpet. Carpet is relatively easy to keep clean and can be soft underfoot. In addition, it can be warm on your feet during the winter months and feel cool in the summer months. The huge number of colors available makes this an attractive choice. Concrete has also come a long way when it comes to flooring. Concrete flooring is not just the boring gray you expect to see in garages and businesses. Manufacturers can stamp, polish, stain, or dye concrete to make it look more appealing. Concrete offers an easy-to-clean surface and responds well to wet conditions. It can be a bit cold in winter as with tile, and some of the treatments, such as polished concrete, can be slippery when wet. Laminate is a good choice for those who love the hardwood floor look but don’t want to spend the money that comes with a professional installation of a good, quality hardwood floor. Laminate is cheaper and can be easier to install compared to hardwood flooring. It also looks great, but over time it can fade depending on the type of laminate flooring you purchase. Try to find one with UV protection as this will extend how long your flooring will look good. Hardwood is one of the most beautiful types of flooring you can have in your home. 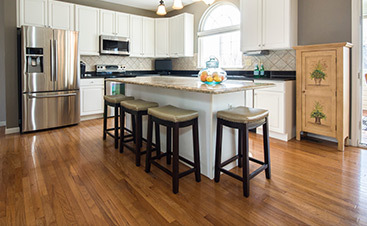 Hardwood floors withstand the test of time when treated correctly. A nice, light wood color can look great in your sunroom or four season room, and these colors are less likely to show fading compared to the darker wood stains. 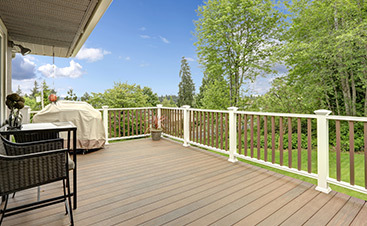 In the summer months, the wood will stay cool on your feet but won’t keep the heat in the winter months. This is another flooring option that may require you to add some throw rugs for warmth. The care of hardwood floors is a bit more intensive than some of the other flooring mentioned here, especially when it comes to the floor getting wet. Water and dampness can be rough on your hardwood flooring if it’s not properly treated. Take care of moisture and dampness properly to prevent mold or rotting. If your sunroom or four season room is going to be hit with a large amount of traffic in and out of your home, linoleum may be the choice for you. This is one of the toughest materials you can use for flooring. It’s easy to clean. Although linoleum has been out of fashion for years, trendy linoleum designs are coming on the market as this material is seeing a resurgence. Linoleum is made from natural materials, which is always a plus because it is more environmentally friendly compared to some of the other flooring selections. Over time, linoleum may also fade. Try to find brands that offer some type of resistance to the sun’s rays. You have a rather tough choice to make with the wide variety of flooring types available for you to use in your sunroom or four season room. Each has their own style, and you can decide which is the best match for your lifestyle and your personal taste. Once you decide on a flooring type, Flortec is here to assist you with your installation needs. Once you have your new floor, you can enjoy this room year round no matter what mother nature throws at you.